With its Seki Magoroku Shoso range kai is expanding its portfolio of high-quality Japanese chef's knives with a new series in a fully all-steel look. Shoso combines lightness and dynamic functionality with precision in an elegant and practical way. Made of 1K6 stainless steel, with a hardness of 58 (±1) HRC, forged blades are sharpened and honed to perfection with new precision technology. In order to reduce resistance to the cutting edge, the blades are sharpened with a slow grinding speed and finished using the latest process technology. As a result the blades offer excellent long-lasting sharpness and guarantee a high level of functionality for daily use in the kitchen. In combination with the ergonomically shaped handle made of 18-8 stainless steel, the weight of the knives is light and ideally balanced. Due to its material properties the symmetrically shaped metal handle is particularly robust. The seamless transition between blade, bolster and handle emphasises the clear, dynamic lines of the knife and ensures optimum hygiene. The deeply embossed diamond pattern on the sides of the handle ensures a secure grip. Manufactured in Japan, the Shoso series consists of ten different blade shapes. They include two all-purpose knives, three chef's knives and two Santokus with different blade lengths. In addition there is a Santoku with a hollow edge, a bread knife and a Chinese chef's knife. The Kai Seki Shoso, 6.5-inch Santoku Knife is a similiar knife to the typical chef's knife. Well rou.. 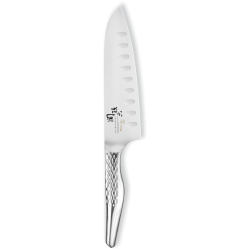 The Kai Seki Shoso Chef knife is the workhorse blade in many kitchens, and it is a must-have for var.. The Kai Seki Shoso, 6-inch Utility Knife is a perfect fit for food preparation tasks that are too bi.. The Kai Seki Shoso, 5.5-inch Santoku Knife is a similiar knife to the typical chef's knife. Well rou.. The paring knife is an indispensable kitchen prep knife. For peeling, trimming, making decorative cu.. Bread knife works with wide, “low frequency” wavy serrations that are not only razor-sharp, but they..